Hodgkin lymphoma is a curable cancer when diagnosed early. During the past decade, 85% to 97% of patients who underwent treatment survived for at least 5 years. However, the survival of these predominantly young adults and children has increased their susceptibility to developing heart disease and/or secondary cancers from radiation therapy, chemotherapy drugs, or both. Fortunately, advanced radiation therapy techniques have helped reduce the radiation dose exposure to the heart and other organs-at-risk (OAR). Three recent articles share findings and advice for minimizing such exposure in Hodgkin lymphoma patients in community-based and academic treatment centers. Radiation oncologists from the Ballarat Austin Radiation Oncology Centre, Victoria, Australia, describe a method for a community-based radiation oncology department to implement a deep-inspiration breath-hold technique (DIBH) in a case study published in the Journal of Medical Radiation Sciences.1 The project’s objective was to evaluate the potential of DIBH and intensity-modulated radiation therapy (IMRT), either alone or in combination, to optimize the therapeutic ratio in patients with mediastinal lymphoma. The patient described in the case report was a 24-year-old man with unfavorable bulky stage IIB classical Hodgkin lymphoma involving mediastinal and right hilar nodes. He was treated with 4 cycles of chemotherapy followed by involved-site radiation herapy to a dose of 30.6Gy in 17 fractions. 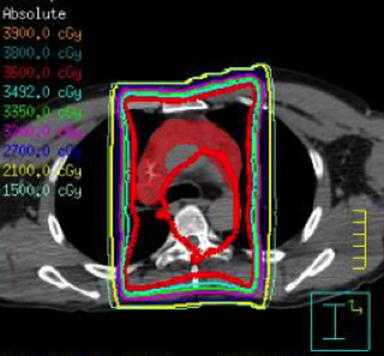 Computed tomography (CT) scans of the patient were acquired during free-breathing and DIBH for radiation therapy planning. Four-dimensional CT (4DCT) was used to assess respiratory motion during free-breathing, and the Varian Real-Time Position Management (RPM) system (Palo Alto, California) along with video goggles were used for respiratory monitoring during DIBH. The authors then created 4 radiation therapy plans: a 3-dimensional conformal radiation therapy (3DCRT) plan with both free breathing and DIBH, and a “butterfly” technique IMRT plan with both types of breathing. All plans were optimized to keep the dose to all OARs as low as reasonably achievable while maintaining adequate target coverage. The combined DIBH and IMRT plan reduced mean heart dose by 3.5 Gy (20%) compared with the “standard” free-breathing 3DCRT technique, while maintaining optimal target coverage. The authors noted that DIBH reduced both cardiac and lung doses compared to free breathing whether 3DCRT or IMRT was used. The authors explained that this was achieved through elongation of the heart, resulting in greater separation from the target volume and an increase in lung volume (by 1950 ml, or 61%, in the case described). “Practical implementation of DIBH and IMRT in the setting of mediastinal lymphoma is relatively straightforward,” lead author Jonathan M. Tomaszewski, MD, explained. Patients are often young with good respiratory function. Deep-inspiration breath-holding coaching takes between 10 and 20 minutes at simulation and before the first treatment. The process only added a few minutes to each treatment session. And while cone-beam CT acquired over multiple breath-holds is feasible for radiation oncology departments with cone-beam CT equipment, the center relied on their RPM device and daily kilovoltage imaging, which worked well. Patients with early stage disease were categorized either as early favorable (EF-HL) or unfavorable (EUF-HL) based on such factors as older age, extra-nodal disease, a bulky mediastinal mass > 10 cm or more than 3 disease sites. Patients with advanced disease were allocated to initial therapy according to their baseline International Prognostic Score (IPS). Less than one-third of the patients received radiation therapy, with a higher percentage of patients with early stage disease (46%) receiving it compared to advanced stage patients (13%). The authors wrote that “concern regarding long-term effects of RT has lately led to practice patterns foregoing radiation in early Hodgkin lymphoma.” They stated that the discretionary use of involved-site radiation therapy with these patients paralleled the real-life approach to radiation therapy use in current practice. The 5-year PFS of patients with interim negative PET in whom radiation therapy was substituted with 2 more cycles of chemotherapy (ABVD) was identical to those who had radiation therapy. Although nonrandomized, the study suggests that for young patients with nonbulky disease, this treatment is safe and may save long-term complications caused by radiation therapy. Principal investigator Eldad J. Dann, MD, of the Rambam Health Care Campus in Haifa and colleagues provided a detailed comparison of the PFS and OS of their patient subgroups with the published results of many recent clinical trials in their article in the British Journal of Haematology.2 With respect to each subgroup, they also explained how PET/CT imaging influenced the various treatment regimens. The authors defined differential dose-volume histograms for the lung, female breast and esophagus. They used 3 models to determine the patient-specific organ equivalent dose (OED) and the relative lifetime attributable risk (LAR) of developing malignancies. The models showed that the estimated lifetime risks for lung and breast cancer due to ISRT were systematically and significantly lower than those from the IFRT. Also, radiation-induced esophageal cancer from ISRT was up to 3.8 times smaller for males. However, there was no significant difference between the LARs for esophageal cancer development estimated by the ISRT and IFRT plans. Tomaszewski JM, Crook S, Wan K, et al. A case study evaluating deep inspiration breath-hold and intensity-modulated radiotherapy to minimise long-term toxicity in a young patient with bulky mediastinal Hodgkin lymphoma. J Med Radiat Sci. 2017;64(1):69-75. Dann EJ, Bairey O, Bar-Shalom R, et al. Modification of initial therapy in early and advanced Hodgkin lymphoma, based on interim PET/CT is beneficial: a prospective multicentre trial of 355 patients. Br J Haematol. Published online June 7, 2017. Mazonakis M, Lyraraki E, Damilakis J. Second cancer risk assessments after involved-site radiotherapy for mediastinal Hodgkin lymphoma. Med Phys. Published online May 11, 2017. Reducing radiation therapy treatment risks for Hodgkin lymphoma . Appl Rad Oncol.